As the largest EPDM Rubber Roofing Suppliers for Bradford & Leeds you can be sure that we will have what you need in stock and ready to go at the most competitive rates around. We keep a huge stock of Firestone EPDM membrane at the best prices around with a 20 year guarantee. We have an installation team with a combined total of over 40 years experience in installing EPDM rubber flat roofs for customers throughout Leeds and Bradford. Call now for a free no obligation quotation. 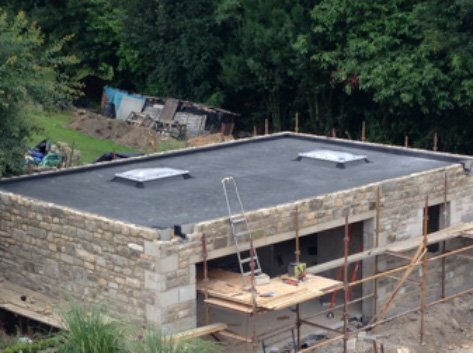 Alvadac Installs EPDM Rubber Roofs across Yorkshire. Why Choose Alvadac for your EPDM Roofing? Alvadac are a family run business, providing a roofing trades company with a combined total of over 40 years experience in supplying and installing EPDM rubber roofs and flat roof systems to the Yorkshire area. Our focus is firmly on being able to give our customers exactly what they require, either supplying them with best quality materials or an installation to the highest standard. Our extensive experience means we know how to identify and supply the highest quality roofing supplies available at an affordable price. Our products are used by a wide-ranging network of professional surveyors and installers, and we provide excellent services throughout the UK. We also offer all the accessories needed to complete your roofing project to the highest standard. Our local installation teams are experienced, friendly, and able to give you all the information and advice you need to make the installation process as smooth as possible, no matter the scope of your project. As a family business, we firmly believe that giving our customers the best possible product at competitive prices as a standard will in turn lead to a good working relationship with our customers. Providing second to none customer service and support on purchases and installations, including our full 20 year guarantee, Alvadac has the advantage in an industry where this is sadly lacking. Our portfolio of recent work speaks for itself. We have worked on projects large, small, commercial and residential, and are confident that at Alvadac we can find the right solution for you. If you need EPDM rubber flat roofing in Yorkshire then look no further! We offer our services in Leeds, Bradford and beyond. Give us a call today on 01274 317 091 for a no obligation free survey and quotation and see how much Alvadac can save you.